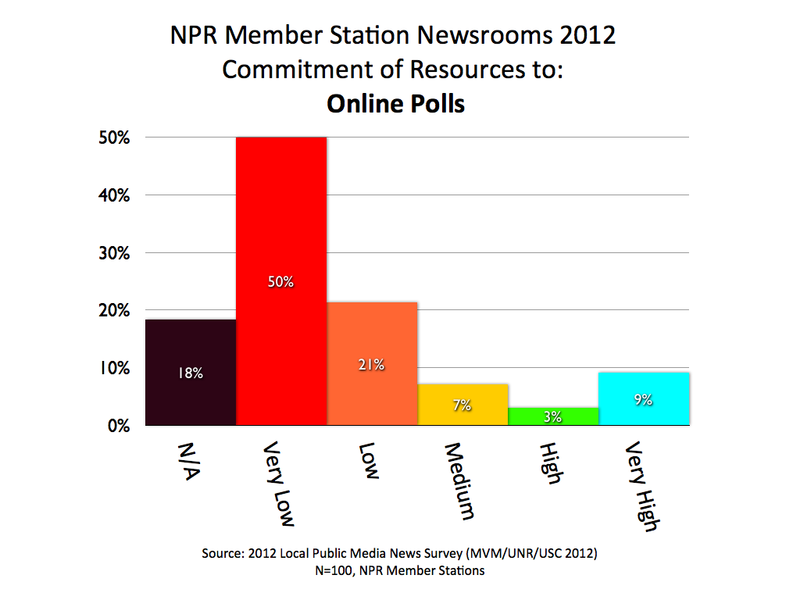 Research about change in U.S. public radio newsrooms. 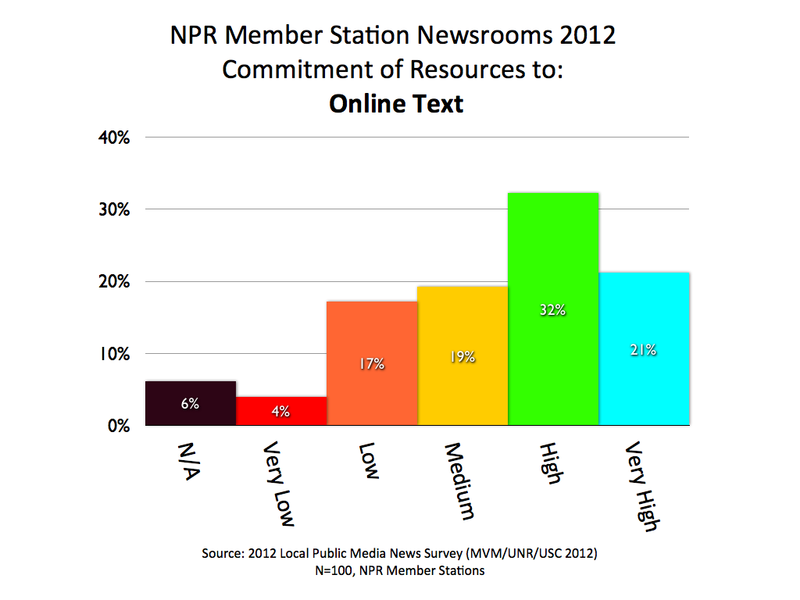 Our 2012 survey of local public media newsrooms shows that most stations still have rather stunted commitments to local news online. We begin with this overview picture of online content commitments. The chart is stacked from most prevalent to least prevalent content types (ascertained by gauging “commitment levels” to these options). These 2012 data are similar to the findings gathered in 2010 (though not directly comparable, due to adjustments in methodology). It should be noted that, while many stations show limited commitments to online news, the survey found a pent up dissatisfaction with online news. That data is here. What follows is a chart by chart review of these online content types. Radio stations specialize in providing audio, so this content type gets the greatest adherence by local public radio newsrooms. Almost two thirds of them have high or very high resource commitments to audio online. Text is the dominant form of communicating news online. The degree of commitment to online text by local newsrooms is tantamount to their overall degree of commitment to online local news. Half of stations are there in a big way. A quarter of stations are doing very little. 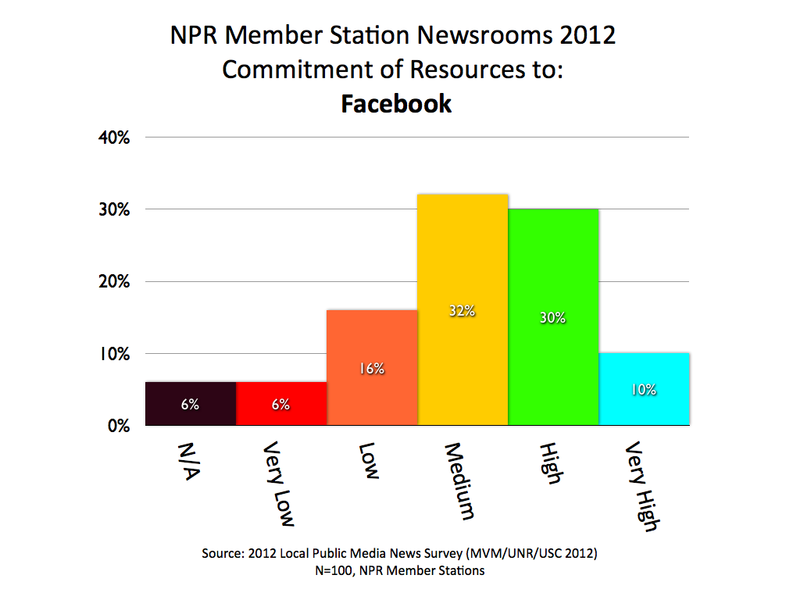 Forty percent of stations are highly committed to Facebook as a platform for local news. Another 32% have a medium level commitment. Radio newsrooms are gradually employing their eyes, not just their ears, in their news gathering. So far, only a third have a high commitment to photography in their digital news. 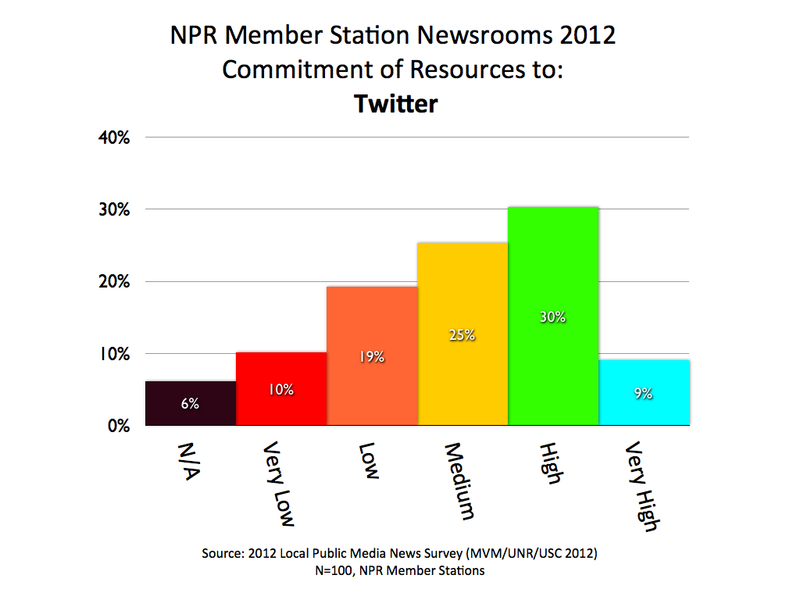 Twitter is increasing its importance to local NPR station newsrooms. Commitment to the micro-blogging service is now almost as high as Facebook. As we continue down the list of online content types, there’s a big drop in commitment levels here in looking at online comments. 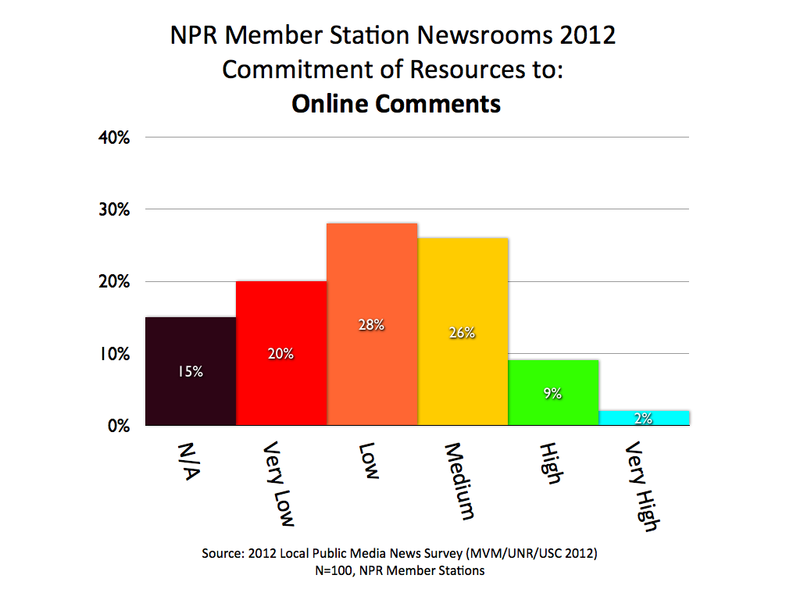 Three quarters of the NPR stations show a low or lower devotion to managing the online comments of others. While photographic slideshows pair well with audio news stories, local NPR stations express an overall low commitment to slideshows. 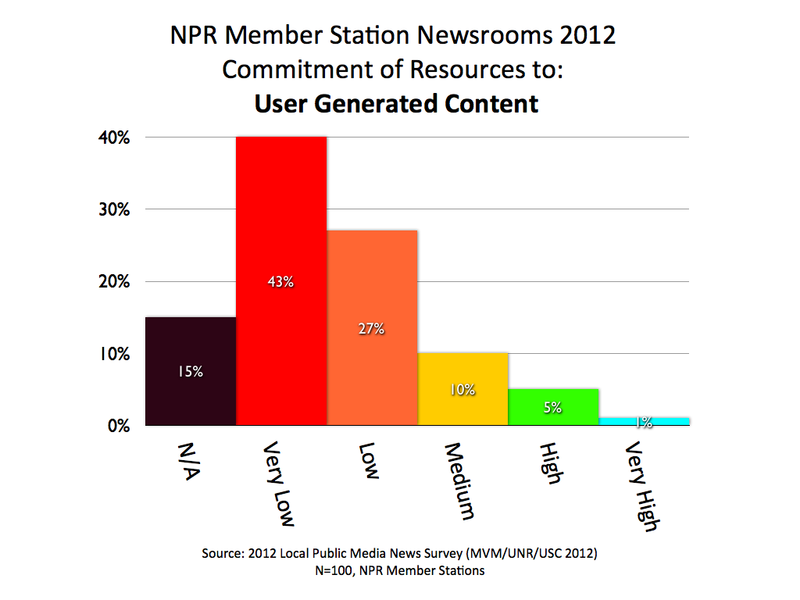 The NPR Argo Project advanced the virtues of local newsroom blogging on specialized content, but the overall system is not rushing to the use of local news blogging. Only 16% of stations claim a high or very high commitment. Over 70% of stations are on the low end of the chart. Considered one of the most shareable and promising forms of digital content, videos are also largely ignored by NPR station newsrooms. 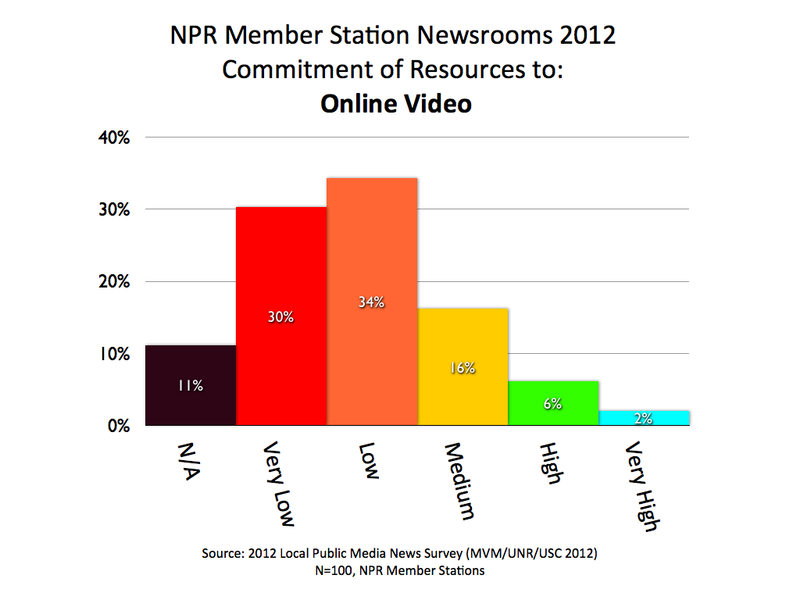 Three fourths of stations show low, very low or non-existent commitment to video. 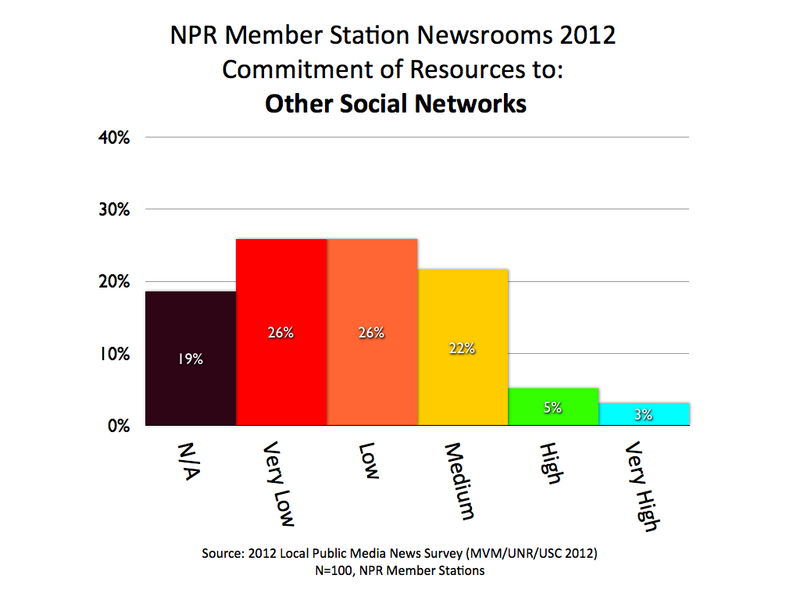 Facebook and Twitter got high usage by local public radio stations, but other social networks… not so much. Local news stories are greatly enhanced when we use all our digital muscles to convey information and drive interactivity. Maps are a great example of this. However, at least two-thirds of local NPR newsrooms are doing very little to take advantage of maps in their online journalism. Data visualization, like maps, help tell online stories and make complicated data simple to understand. A whopping 83% percent of local public radio newsrooms are largely bypassing data visualization content. Very few stations are endeavoring to cull content provided by the public. 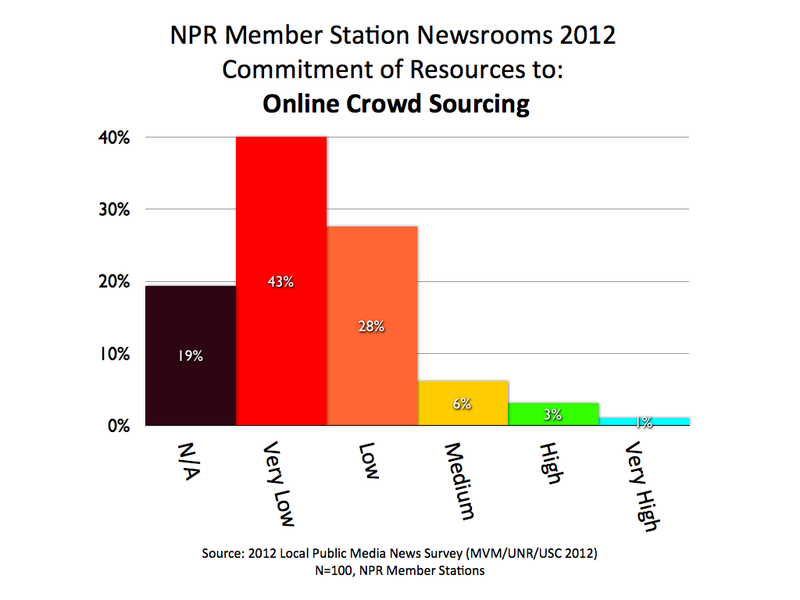 We thought this chart on crowd sourcing might have higher levels of commitment because of the Public Insight Network that many stations are using for news research. But the commitment levels are among the lowest of all online content types in the survey. The least popular of online content types is the online poll. Almost 90% of station newsrooms have better things to do. The 2012 Survey of Stations was conducted by Michael V. Marcotte of MVM Consulting in coordination with the University of Nevada School of Journalism, where Marcotte is a visiting professor. Collaborating on the invitation only, online survey was PhD candidate Sandra Evans of The Annenberg School of Communication at the University of Southern California. 136 stations participated, 103 of them were NPR members. New survey results from MVM Consulting show NPR stations far less satisfied with their online local news than with their local news on air. 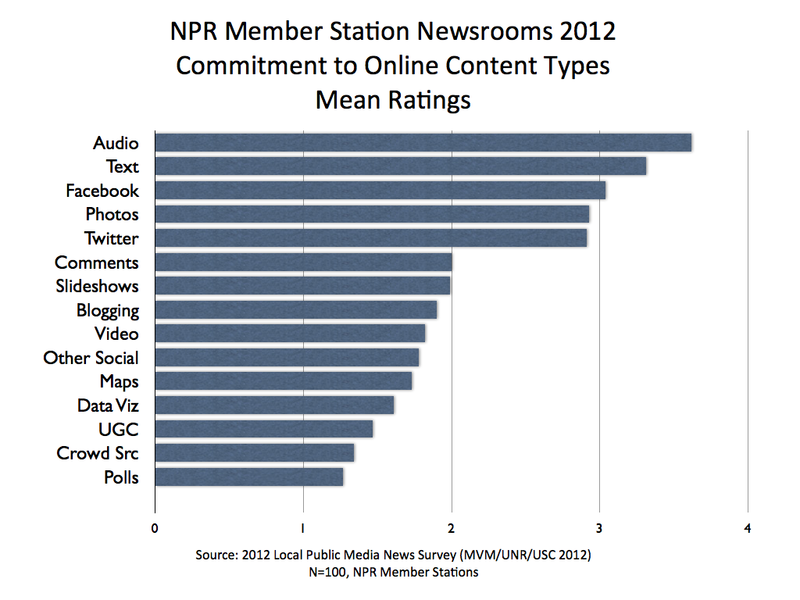 The data show 72% of NPR stations are “satisfied” or “very satisfied” with their on air local news programming. Only 10% were at all dissatisfied with the broadcast product. But when the same question was asked about each station’s online local news content, the responses were far less effusive. A third of stations expressed dissatisfaction. As reported earlier, stations are reporting efforts to expand their online news staffing and content. But for now there’s a significant gap between their levels of satisfaction, radio versus online. 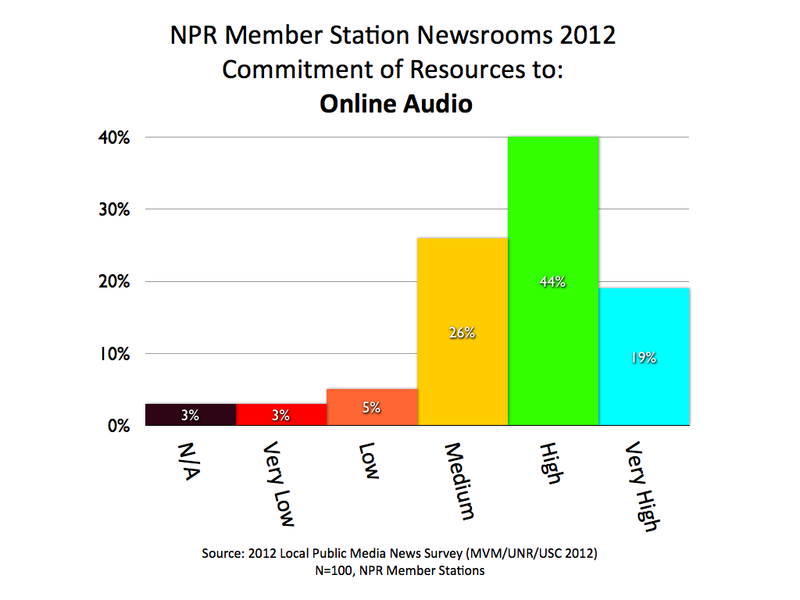 A new survey by MVM Consulting shows NPR member stations around the U.S. are growing their local news staffs, increasing their local news airtime, and beefing up their local online news content. The survey reveals high levels of actual growth last year and similar levels of predicted growth this year. The growth begins with news staffing. 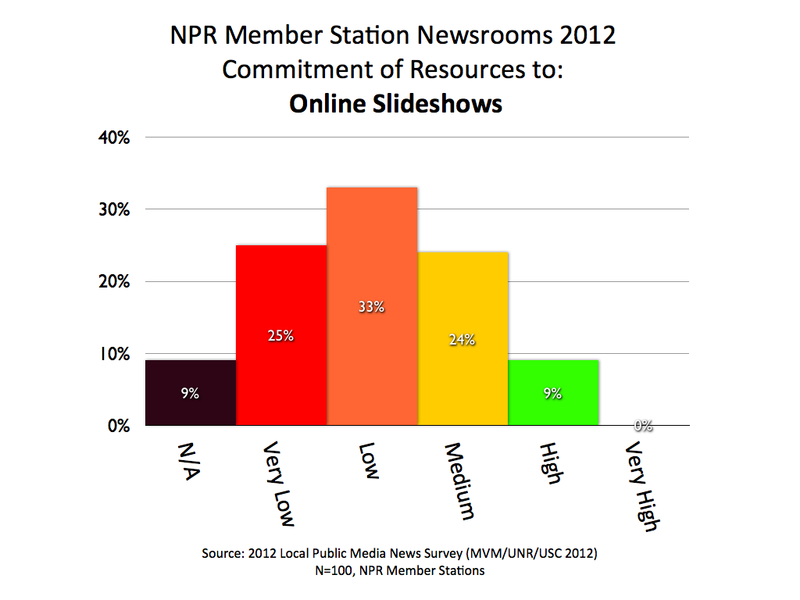 More than 40% of NPR member stations grew their full-time local news staffs slightly or significantly in 2012. While 50% reported no change, only 8% saw decreases in staffing. 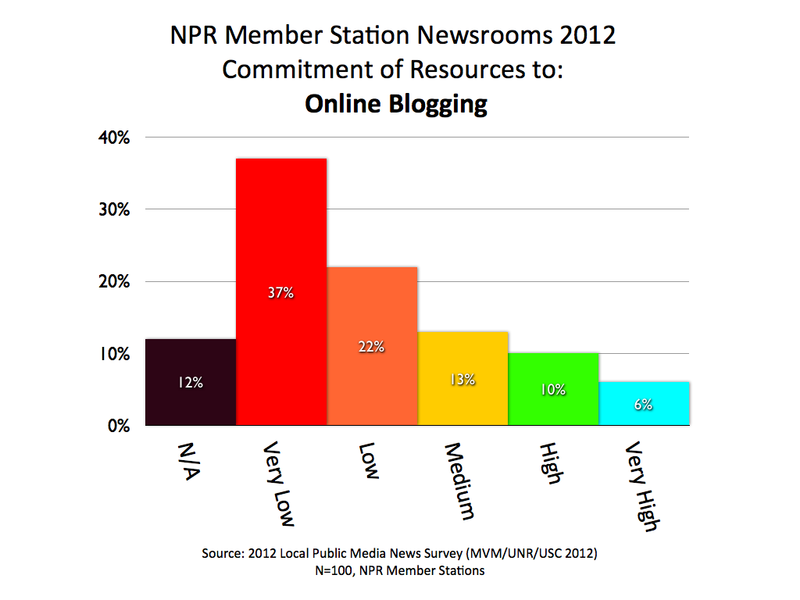 Looking ahead to 2013, another 38% of NPR stations are optimistic they’ll be growing full-time news staffs. Only 4% expect they’ll be downsizing. 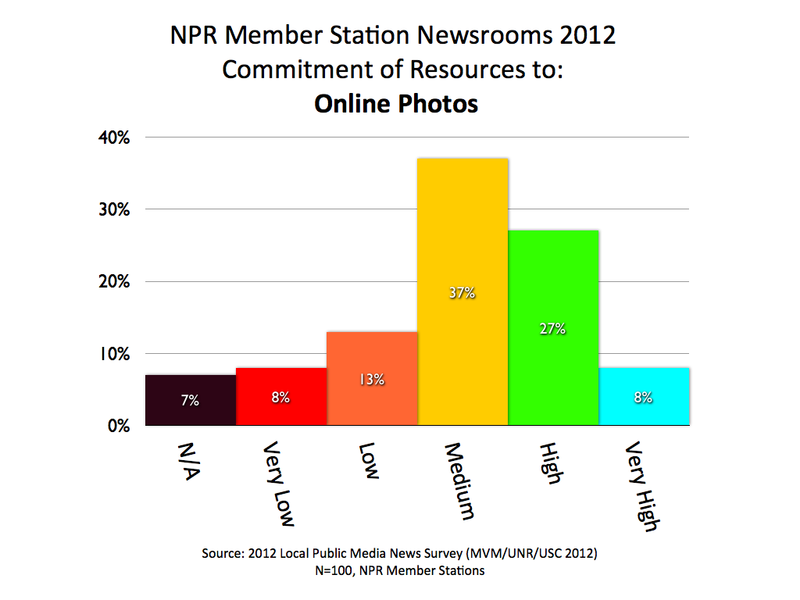 The largest share, 58%, expect to maintain current levels of newsroom staffing. These are healthy signs — even healthier than the growth estimates of 2010, when a similar survey found a fourth (27%) of all public radio stations grew their local news staffing, while 14% had cut back during the national recession. The survey also found an ummistakeable emphasis on advancing local news online. Almost two-thirds of local NPR stations say they increased (slightly or significantly) their local online news content last year. That growth emphasis continues in projections for 2013. Seventy-one percent of stations say they expect to increase their local online news offerings this year. The survey also asked station leaders about changes in the amount of local news or public affairs on air. While 60% reported no change in 2012, a third of stations said they expanded local news on air. And, as with staffing and online content, the trend is predicted to continue in 2013. Forty-five percent of stations say they will increase local news airtime this year.